In the Western Premier League on Saturday, Stafforce Dumfries beat Drumpellier at home and moved into the top half of the table after posting an imposing total of 261 for 7. Josh Forsyth top scored with a hard hitting 76 aided by 57 not out from Scott Beveridge as the pair revitalised the innings from 5 down for 128. A century opening stand put Drumpellier on the right track but a match-changing five wicket burst from the ETP Electrical Man of the Match Chris McCutcheon set them back to 153 for 6. However the lower order hit out and although the home side win looked safe during the final few overs their efforts still took the visitors to 252 for 7 off the fifty overs, ten runs short, on a day of runs at Nunholm. With the other day’s results Clydesdale are the West Champions-Elect for 2015 as they require a mere one point, or one wicket, from the remaining two matches. 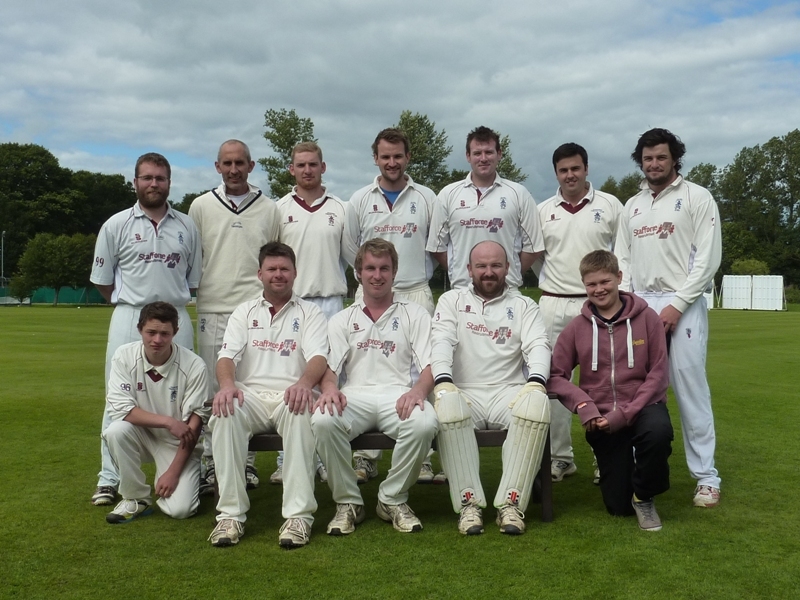 Stafforce Dumfries lost out in the Murgitroyd Scottish Twenty20 Semi-Final in Glasgow on Sunday. The host club Poloc set a total of 128 for 6 after Dumfries fought back from a half way score of 66 for no wicket. Dumfries then lost two early wickets but were challenging at 67 for 3 at the half way stage. However they ended up needing sixteen off the last over and lost the one remaining wicket to a catch on the boundary. The Stafforce Recruitment Man of the Match for Dumfries was Scott Beveridge for his all-round contribution including a brilliant run out. Having beaten Watsonians in the other semi-final, Forfarshire were later crowned the T20 Scottish Champions after a convincing win over Poloc in the final. In the Western Premier Reserve League, Nunholm were away at Langloan, Drumpellier 2nds, and they dismissed the home side for 180 with APD Ltd. Dumfries Man of the Match Stuart Alexander and Gurupal Singh taking three wickets each. However Nunholm were defeated as they could only manage fifty three in the second innings. Dumfries juniors won yet another close game away against Galloway U12s by nine runs with Tom Currie the Player of the Match for Dumfries, and sixteen year old Chris McBride continued his appearances for Durham Academy in the North East Premier League last Saturday. McBride shared a fifty run partnership with Scotland A, and Durham 2nd XI, player Dylan Budge with Budge scoring the bulk of the runs on his way to a not out ton. On Saturday, in the Western Premier League, Stafforce Dumfries take on West of Scotland at home at Nunholm, with Wests fighting relegation having moving to last spot with two sides to go down. Dumfries 2nds, Nunholm, are away at Partick in the Premier Reserve League.